School is back in session! For my girls it means a couple mornings a week, but these is a new feature to these days- packed lunches. Hats off to you moms and dads out there that rock packed lunches for your child everyday. Especially if it’s more than one child. 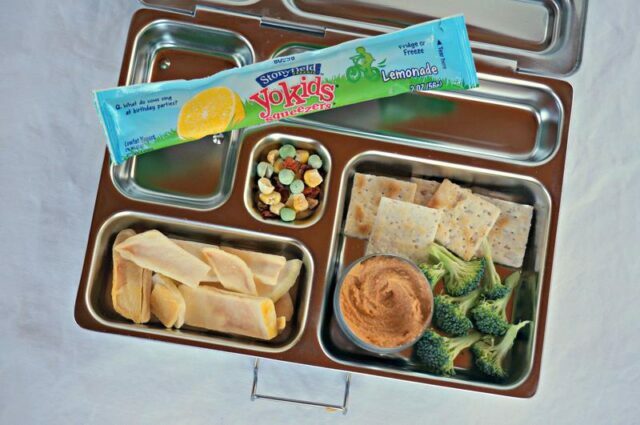 It’s not the easiest to come up with healthy lunch options that work in a lunch box and that children will actually eat. To add one more twist to situation, a lot of schools require peanut-free now, which is totally understandable. Packing for Hailey, who is almost 4, is fairly simple as she can handle a wide variety of food sizes/textures and her dexterity skills for things like dipping are well developed. Kaitlyn, 15 months old, however, is a different story. There are several factors I considered when creating appropriate lunches for her. Bite-sized pieces. Though she handles food well, she is still very young and I wouldn’t feel comfortable with her left to her own free will of biting chunks out of sandwiches or other foods without my supervision (call me helicopter mom if you must!). Ease for the teachers. Kaitlyn is in a class with other young toddlers, all who bring a lunch. It’s tough enough feeding one child a meal, I can’t imagine trying to feed 8-10 at one time. 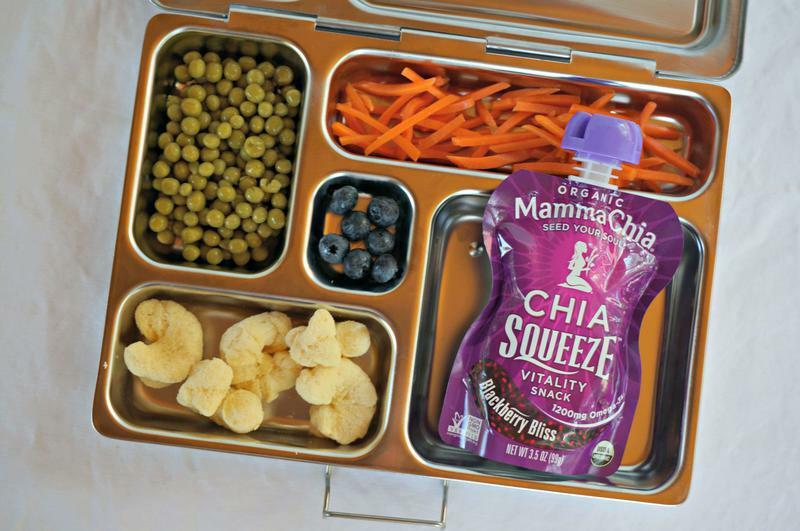 I thought about the chaos of teachers running around and opening a million tiny containers (which is why I love the ease of our new Planetbox lunchbox), wiping faces, picking up tossed sippy cups, etc. The last thing I wanted to add to the list was another task, like spoon-feeding my child a yogurt. Mix of macros. Fruits are pretty simple. Vegetables can be a little tricky. Protein is fairly easy, but finding nut-free fats that fit the above criteria is a little more challenging. I considered trying to make a somewhat-balanced meal. Peanut-free. Which I’m happy to do because I’m sure the fear of a mom sending her allergic-to-peanuts child to preschool is ridiculously scary. The least I can do is pack peanut-free. Fruit Options: blueberries, mandarin oranges, grated apple, sliced grapes, sliced kiwi, craisins, raisins, freeze-dried fruit, cubed melon, diced peaches, pouches, etc. Vegetable Options: peas, sliced cherry tomatoes, leftover roasted vegetables like sweet potato cubes, steamed broccoli or cauliflower, grated carrots, spinach puree baked into muffins, pickles, pouches etc. Protein Options: Diced ham, diced turkey, grated cheese, Greek yogurt pouches or tubes, beans, almond butter sandwich bites, diced boiled eggs, cubed tofu, etc. Healthy Fat Options: Sliced black olives, full fat yogurt, hummus, diced cheese, chia seed pouches, olive oil based dressing on pasta salad, diced boiled eggs, Larabars (or homemade laraballs with almond butter), etc. Carb/Filler Options: Pasta, mini cheddar cheese and cracker bites (we like these), slightly overcooked brown rice (it will stick together more easily), healthier cookies (we like these letter-shaped ones), crackers for hummus, Cheerios, toast cubes, animal crackers (we like these), puffed cheese bites like Pirate’s Booty, homemade oatmeal bites, etc. Fellow lunch-packing parents, what foods do/did you find were good options for young toddlers? 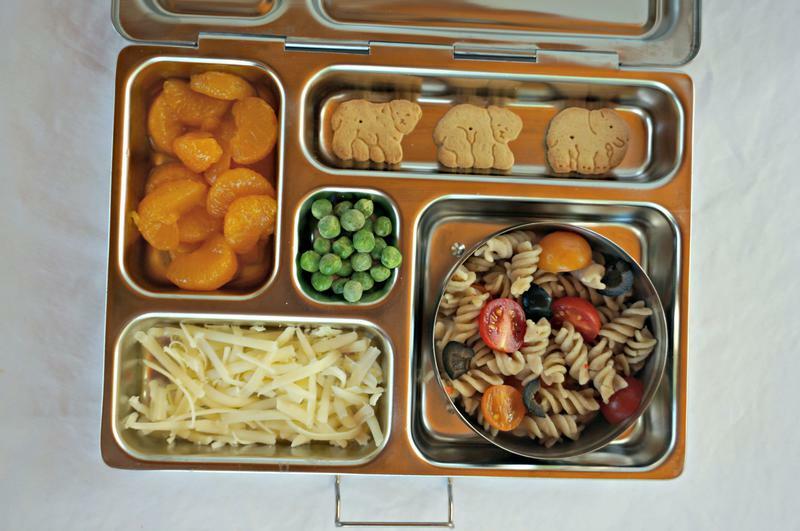 What was your favorite packed lunch as a kid? 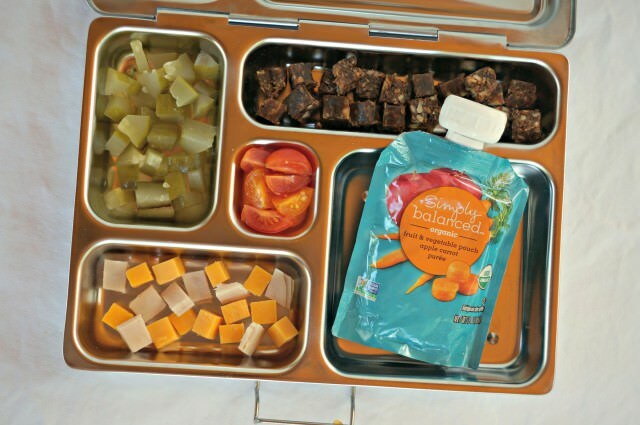 For more meal ideas and child-food focused talk, check out my Munchkin Meals Page! My child’s preschool actually has a no snack/lunch rule at school this year. As a food allergy parent this makes my anxiety level go down about 50%. They will have a popcorn option if the kids are having a rough day. I really dread the day I have to start packing lunches as my child cannot do lunch meats, eggs, and many of the traditional options. I’m going to save some of these options you have posted. Love these ideas! I can’t tell you how many times I stand in front of the fridge and pantry thinking to myself, “what am I going to pack? 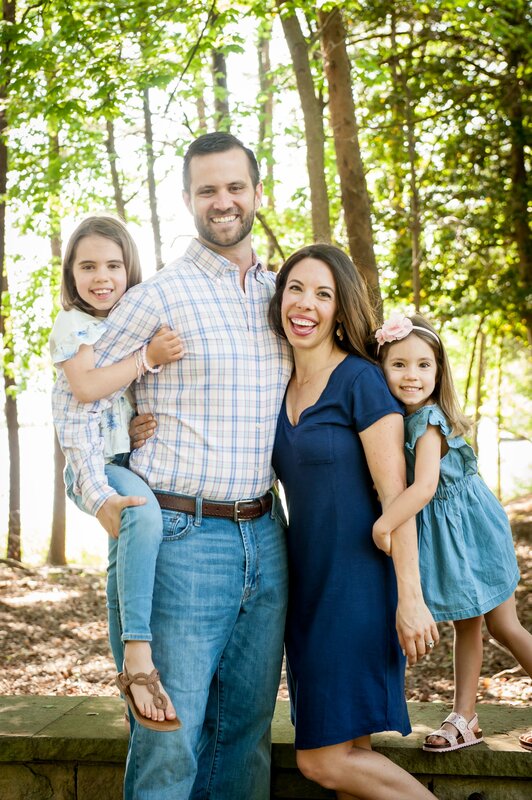 ?” One of my girls does have the dreaded peanut allergy, so I appreciate other parents, like yourself, really taking these types of allergies seriously when packing lunches! These are great ideas! Both my kids schools are nut-free so it’s hard to figure out what to pack for snack and lunches. My son likes Applegate pepperoni so I’ll roll it together with some mozzarella cheese slices. We also do a lot of grapes. I’m definitely going to try the carrot shreds idea with my 4-year-old. Love applegate pepperoni- what a great idea!! These look so adorable I want one for lunch! I love this post so much! With my 10 month old I’m always trying to think of things to pack him for daycare. And I definitely want a planet box…do you know if they ever have sales? Right now I pack him sliced grapes, blueberries, banana, watermelon. He also will get a yogurt pouch some days or unsweetend apple sauce. He’s also into hummus now which I dip with cucumber or olives. He will also get cut up pancake or french toast. I’m not sure if they have sales- I bought Kaitlyn’s last week and they had a couple specials (free magnets, etc) but it was still really expensive. I will say though it is incredibly durable and so far I’m so impressed with it’s ease of use and clean up! 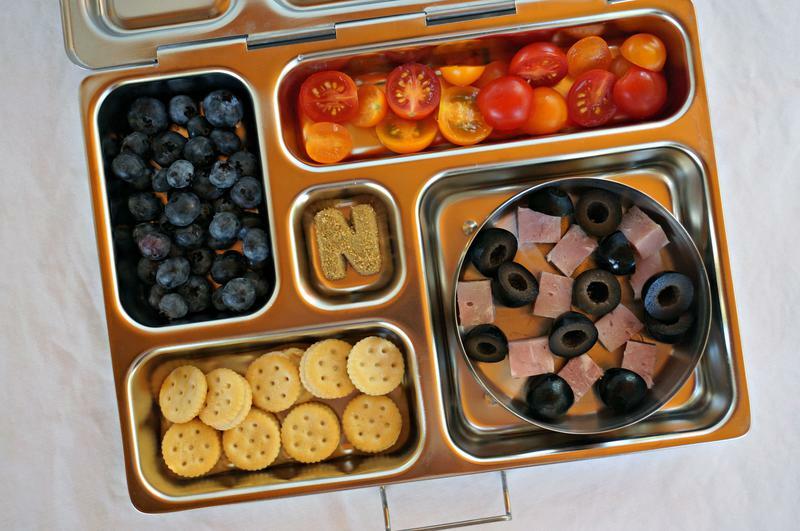 My 20 mos old has cashew allergy so thx for these amazing ideas! Do u have the recipe for spinach muffins and oat bites? Also what brand crackers (for hunmus), brand ham and turkey do u buy? Heather recently posted..Where there is joy. Great ideas. I still struggle with getting Georgina to eat anything; she continues to seem to live off of milk. Do you give Kaitlyn raisins? I’ve been afraid with of them being a choking hazard with being stiff/sticky. I should try them on G. She also wont do pouches or anything that sticks to her hands – such a princessa! Well on the other end of the spectrum, my girls won’t drink milk at all! I’ve basically given up. I do give Kaitlyn raisins and she has handled them well, but certainly work up to what feels comfortable to you (I still quarter grapes ;)). I’ve found the most success in staying consistent and not making it a power struggle 🙂 You’re doing great!! Thanks for this! 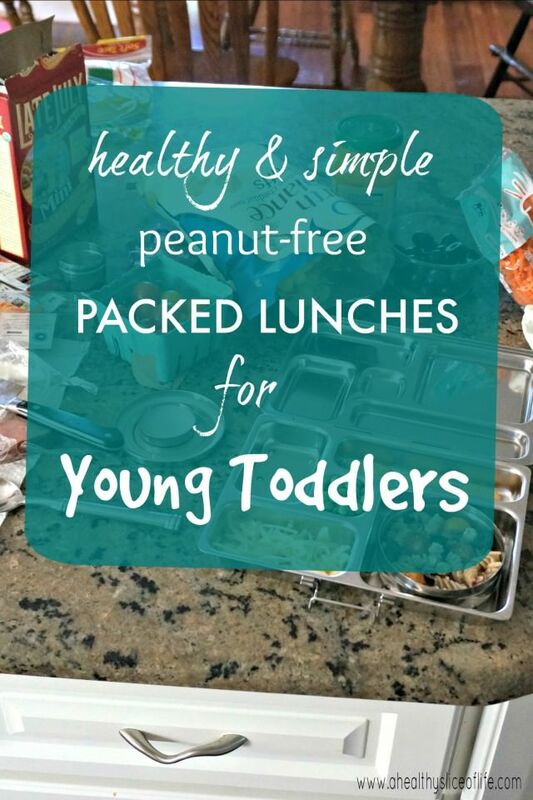 I’m always looking for new lunch/meal ideas for my toddler and have been in need of some inspiration! Love the ideas…. and the lunch boxes! Where did you get those? Wyatt is a pretty picky 2 year old, and he goes to school twice a week so I try to give him stuff I know he will eat. It always consists of string cheese or yogurt and some type of fruit. Then I’ll make him a pb&j (not a nut free school) or a cheese quesadilla. I wish he would eat more veggies! I worked at a Preschool that was completely nut-free so my suggestion to parents as a substitute was Soynut Butter and Sun Butter, they taste close enough to peanut butter without the scary reaction. THANK YOU! This post was so needed! My 10 month old goes to daycare, and i’ve followed your BLW approach, which therefore has made him not want much baby food. I don’t blame him 🙂 But i have such a hard time coming up with balanced lunches for a peanut free daycare! Thank you! Great ideas! What lunchbox are you using? We have tins from PB kids, but I would love an all in one thing I can send in. 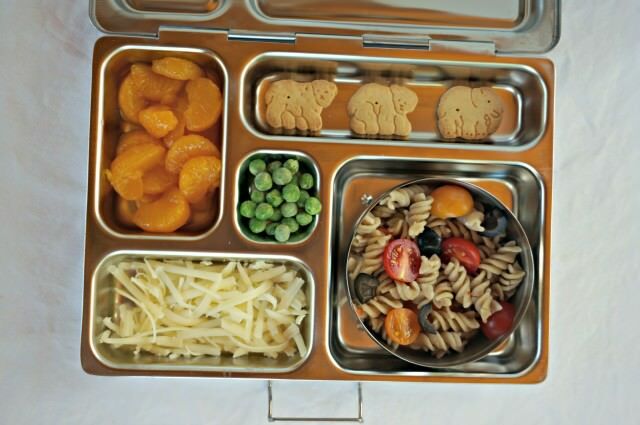 Some great ideas and I love that lunchbox! My dad used to make us peanut butter sandwiches everyday. But he would try and add some vegetable so we got peanut butter and capsicum, cucumber or lettuce. They were so soggy by lunch that I never ate them! We pack lunch every day too for my 3 year old son. Buying a small thermos has been LIFE-CHANGING. I can pack leftover soup and crackers, Annie’s mac and cheese, even healthier-ish chicken nuggets (organic, hormone free, etc.). Their teachers cannot heat anything up, but the thermos keeps it warm until lunch. He also loves string cheese, yogurt, apple sauce packets, raisins, apple chips, etc. Peanut free is hard, but it is definitely understandable. Actually our school is free of all nuts.